Child $71.40: Retail Price $84.00 | You Save $12.60 Children under the age of 8 qualify for this pricing. 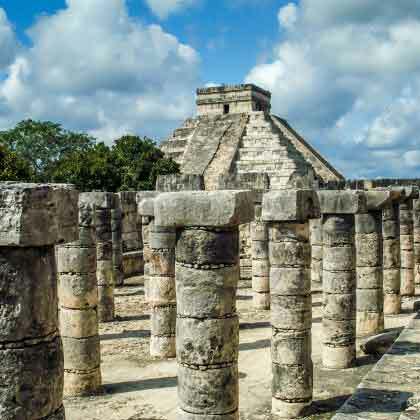 Travel in luxury to one of the New Seven Wonders of the World on our Deluxe Chichen Itza Bus tour from Playa del Carmen. This bus has larger more comfortable seating, tables, tv’s, onboard bathroom, onboard drinks, alcoholic and non alcoholic. 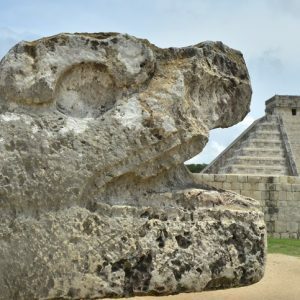 Chichen Itza is one of the best preserved Mayan sites and the pyramid of Kukulkan is sure to knock your socks off. 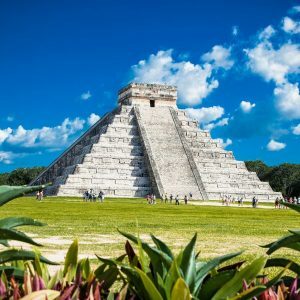 This tour has it all: learn about Mayan traditions and culture at Chichen Itza, relax and swim in an incredible Cenote and visit a Pueblo Magico (Magic Town) enroute back to Playa del Carmen. 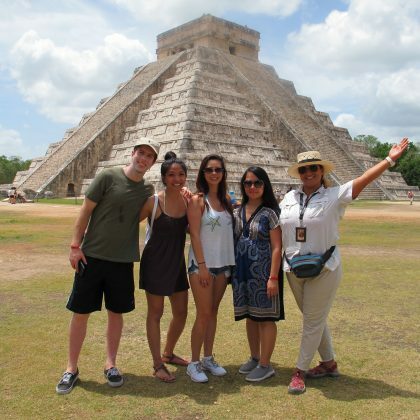 Start the day by enjoying a delicious continental breakfast on the bus before arriving at the Chichen Itza site. 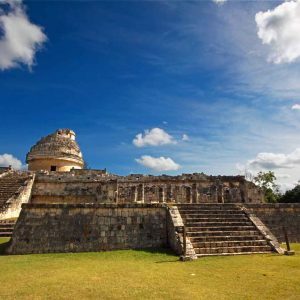 A bilingual guide will take you on a tour for 3 hours, educating and showing you everything that the archaeological site has to offer. 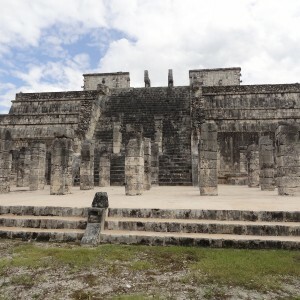 Then you will have free time to wander around the ruins and stumbling upon ancient carvings and tombs. 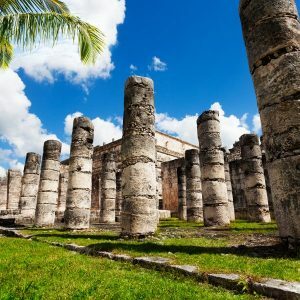 After exploring Chichen Itza in the morning you will be taken to a nearby Cenote (unique to the Mayan Riveria) where you will be able to escape the heat and go for a dip in the clear water. 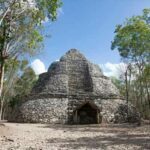 Cenotes are flooded caverns or underground river systems formed by dissolution of rock where you find amazing stalactites, stalagmites, and marine fossils. A tasty lunch will be provided at this point. Round trip Transportation in Deluxe air conditioned bus with TV, seat belts, bathroom, and tables for groups. 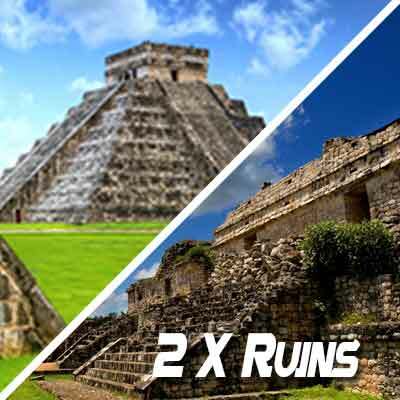 *You will receive your Chichen Itza Deluxe tour confirmation within 24 hours of purchase. 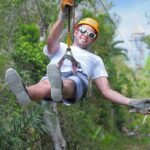 Next day tours must be reserved by 7 pm, and confirmation will be expedited if available. For next day orders after 7 pm, or any other questions please email us at info@wonderousworld.com and one of our team will be happy to assist! This tour was excelente! My friend and I booked it at the last minute and while we didn’t receive confirmation and had to make a few calls to the booking agency late at night to get it figured out it worked out in the end. Customer service was very helpful. The tour itself was so much fun. It’s a long day with several hours spent on the road, but well worth it. The motorcoach was brand new and super comfortable with leather reclining seats, TVs and a clean bathroom. All of the tour staff were very friendly and the main tour guide (Beto) made it fun and informative. The tour was generous with providing some snacks, water and beer! Take the day and go out and explore. You’ll be glad you did! I would definitely recommend this tour if you have kids. It was much more kid friendly on this bus with much more room, tables, onboard drinks, and a light breakfast in the morning. Oh I and I can´t forget to mention the bathroom. A definite neccesity with kids! We nearly got a van tour but after going on this tour we quickly noticed we would have had issues on a regular van tour. 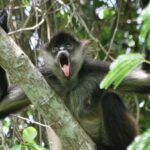 If you are traveling with kids I would highly recommend this tour!